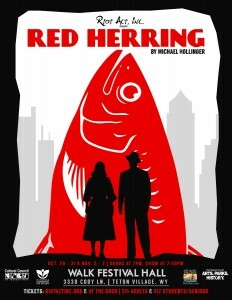 Red Herring – Riot Act, Inc.
November 7, 2015. Curtain at 7:30 p.m., doors at 7:00 p.m. 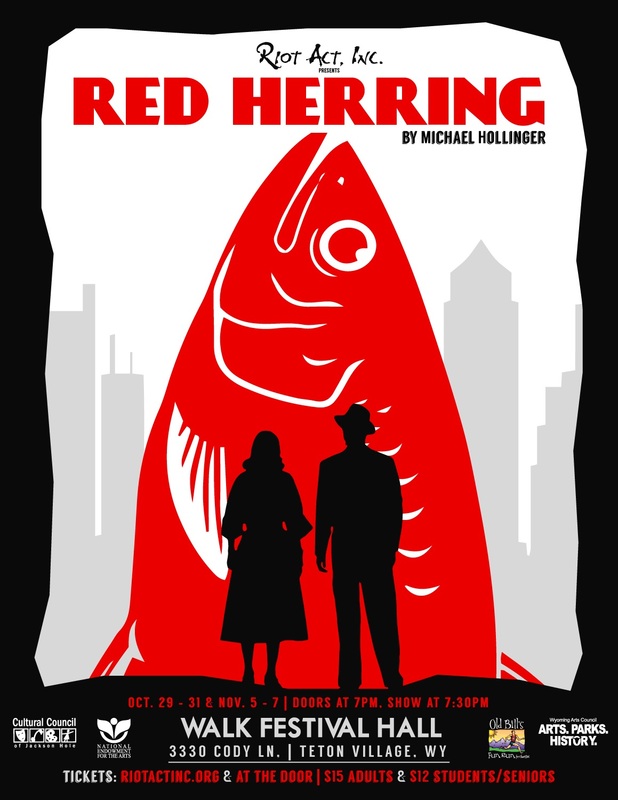 The season kicks off Oct.. 29-31 & Nov. 5-7, 2015 with Red Herring by Michael Hollinger. Part love story, part murder mystery, part espionage plot this 1950s style noir comedy will delight audiences. Maggie, a Boston detective, must solve the murder of the dead guy in the harbor or miss her Havana honeymoon. “A blunt-nosed, sharp-eyed look at love and tying (and untying, and retying) the knot.” ~ Samuel French. Directed by first time director Lacey Lukas and assistant director Heather Best, Red Herring boasts a wonderful cast including Carla Lopez, Deborah Supowit, Graham Koten, Lindsay Burgess, Lynne Matthews, Macey Mott, Marius P Hanford IV, Rhea Lewis, and Ben Medina Lowder. Tickets are available in advance online at www.riotactinc.org or at the door and cost $15 for adults or $12 for students/seniors. Seating is limited, so be sure to buy your tickets in advance. Riot Act, Inc. T-shirts and Run of Show Raffle tickets will be available at the concession stand before each performance and during intermission. Raffle tickets cost $5 for one or $20 for five. This show contains some strong language and sexual references. Parental guidance is suggested.